ArchOver* is now the latest established P2P lending site to introduce auto-lend combined with auto-diversification. The ArchOver Investment Plan, as it is called, does three very useful things, the third is about the type of diversification on offer, which is a feature that deserves expanding on. Firstly, most obviously, ArchOver's auto-lending saves time for lenders who would prefer not to pick loans themselves. This is regardless of whether you want to lend through standard ArchOver accounts or its IFISA. Secondly, the minimum lending amount is just £250. When you choose individual loans through ArchOver yourself, you have always needed to lend at least £1,000 per loan. So through the Investment Plan ArchOver is much more affordable. Thirdly, it automatically spreads your money across different secured loans (see info box on “secured lending”) to small businesses. Some of these loans could have insurance to add extra protection for lenders. Other loans could be to borrowers that ArchOver selects because it finds that they have regular, predictable income streams from their customers. This combination of features makes ArchOver a lot more accessible to many more lenders. 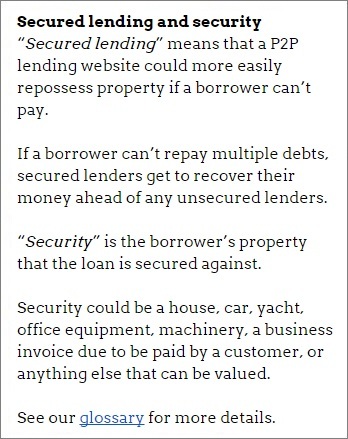 I need to expand on the third point of having your money spread across more loans, because how this is done does make a big difference. Business loans of the type offered by ArchOver are typically secured against the business borrowers' outstanding customer invoices. Put another way, I mean that the business borrower is owed money by its customers, and lenders using ArchOver are effectively entitled to take that money directly as it comes in from the customers, if the business borrower is otherwise unable to repay (i.e. if the loan goes bad). This sort of lending attracts a lot of repeat business, meaning that the same borrower takes out loans repeatedly and often has many loans on the go at the same time. Therefore, if you spread your money around at random, you could end up lending to the same borrower multiple times. That's not a good way to spread your risk. ArchOver therefore guarantees to spread your money across at least ten different borrowers, not just ten different loans, with no more than 10% of your money lent to any one borrower. This is critical, and so it is good to be able to check that box. For someone lending just £250, it means a maximum £25 per borrower. As usual, ensure that you put your money across lots of different P2P lending sites. If you use ArchOver's new auto-lend feature and lend, say, a maximum 20% of your total lending and investment pot through it, it means that you will be lending 2% or less of your money to any single ArchOver borrower. I think that, for most people (since some lenders will perform above or below average depending on the precise loans you've got), that should prove to be sufficient risk containment for these kinds of loans, with ArchOver's known record so far. ArchOver Investment Plan: what happens to the interest paid? The ArchOver Investment Plan doesn't automatically re-lend any interest you receive on a monthly basis, so you will need to either be patient till that pot builds or find a home for the interest as and when it comes in. That shouldn't be a problem if you're lending enough. However, this could be inconvenient if you are lending very low amounts in the ArchOver IFISA – say £1,000 or so. If you are an additional-rate taxpayer or you have a lot of savings or peer-to-peer lending accounts outside of ISAs, you might not want to withdraw the interest to lend it somewhere else as you could lose useful tax breaks. And the amount will be too low to transfer to another IFISA. You will therefore be waiting a long time before you have built up enough interest to lend it again. If you're lending over £2,000 and your loans go smoothly, you might build up another £250 to re-lend in the ArchOver Investment Plan after the initial fixed 26-month lending period is over. When lending small amounts and not re-lending the interest, if your interest rate averages 6.4% as ArchOver intends then the real, effective interest (factoring in the idle, unlent interest) is going to be about half a percentage point below that over two years. In those situations where you are earning less interest because some of your money is unlent, I have noticed that many lenders just focus on the downside. However, there is a substantial upside to counterbalance it: while a small proportion of your money is not being lent out it is also not at risk of becoming a bad debt. So it's not just zero interest but also zero risk of losses from borrowers being unable to repay. As usual in peer-to-peer lending, you might have some of your actual loan money waiting idle if there are not enough opportunities. If there are just eight borrowers available, at most 80% of your money will be lent while you wait for more. Assuming enough opportunities arise within a few weeks, the impact on your interest earned should be minimal. Read more about ArchOver in the ArchOver Review and visit ArchOver*. *Commission and impartial research: our service is free to you. We already show dozens of P2P lending companies in our accurate comparison tables and we keep adding more as soon as they provide us with enough details. We receive compensation from ArchOver and other P2P lending companies not mentioned above when you click through from our website and open accounts with them. We vigorously ensure that this doesn't affect our editorial independence. Read How we earn money fairly with your help. I have a number of loans with Archover and you might be interested to learn that a Company by the name of XXXXXXXX has defaulted on their payments and is being pursued by Archover’s representatives. In the meantime my investment and monthly interest payments are in limbo. This has shaken my faith in Archover’s approach to due diligence. I’ve taken the liberty of editing out the name of the borrower in your comment, because I think it is probably against the lending terms and conditions for you to publicly reveal borrower names. It usually is. It’s just for your own protection. We did update our ArchOver Review recently showing the status of bad debts (https://www.4thway.co.uk/?p=5958) and we always keep the detailed comparison tables up-to-date (go to the compare page, select the checkbox on the right next to ArchOver and then press the “Get more details” button at the top or bottom of the page). But, coincidentally, there have been more bad debts since we updated our review, so we’re going to do another mini update within a few weeks after properly reassessing the situation.